The largest and one of the newer exhibits at the Bluff Maritime Museum is the former oyster boat “Monica”. An historic vessel she was one of the oldest in the Bluff Oyster fleet, being built in 1909 for Lyttelton owners as the Monica II, one of many small steamers working the bays of Banks Peninsula. She was converted into a fishing boat in 1930 when bought by Westport interests, then came to Bluff in 1937 for Stewart Island canneries. In December 1947 her steam engines were removed and two diesels, each 165 b.h.p., installed. Joss, Hans Johnson, George Hoffman, Hiipa Te Maiharoa and Rex Ryan. The Monica was an Oyster boat noted for its speed. On the opening day of the Oyster season she was always one of the first boats to bring the delicacy back to the wharf. 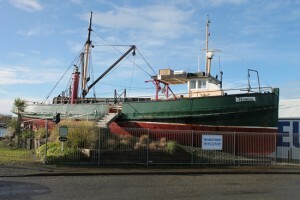 Today she lies high and dry next to the museum rigged as though oystering and fully accessible for all to view. The Monica is an asset to the Museum and a must to see.